If you’ve been following us for some time, you’ve probably noticed that we take steps to broaden our reach whenever we can. Last year, for example, we added online webinars to our toolkit, and we began to regularly stream our seminar content via the internet. And now, we’re taking another step–a pretty big one–with the launch next month of a weekday radio program featuring our professional Social Security Advisory Staff personnel sharing their expertise with a national audience. The program itself will be broadcast in the Washington, DC metropolitan area, but will also be accessible via the internet in its daily 3:30 to 4:00 pm time slot. 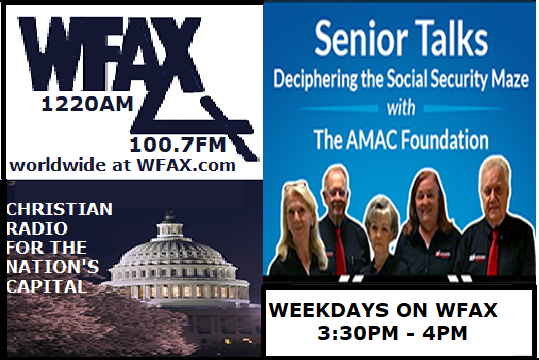 The Association of Mature American Citizens’ AMAC Foundation will offer answers to questions about Social Security on a new program to be aired on WFAX AM and FM in Falls Church, VA. The daily half-hour show will also be available on WFAX’s streaming service on its Web site. The projected launch date for the show, Senior Talk: Deciphering the Social Security Maze, is Monday, March 25, 2019. WFAX is a well-established Christian talk radio station, with a 70-year broadcasting history and a reach extending to millions of residents in Washington, D.C., Virginia and Maryland. And, via the Internet, the station’s programming reaches the entire nation. Weber noted that the Foundation’s highly acclaimed Social Security Advisory Service handles an average of 300 requests for assistance each month. “The Service will now be made available directly millions of listeners in America’s seventh largest radio market,” Weber added. Hafer said that the recorded daily broadcasts will be archived and eventually made available for on-demand access through the Foundation’s main website.